Here is a little treat for all of my lovely readers the photograph below was taken in a small restaurant in Nice, France. What can I say? 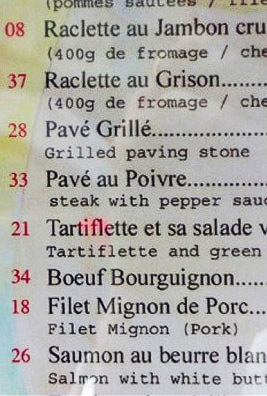 We all know that the French think that they are the best cooks in the world after they stole all of the Italian recipes in Provence but “Grilled Paving Stone” – no thanks I think that the Cat will pass on that thanks so what ever you do don’t order number 28 on this menu! By the way have you noticed the number system on the menu, do you think that the number represent some sort of indication of how dangerous each dish is? Just a thought. I know that a lot of my wonderfully loyal and extremely cuddly readers are waiting and in some cases clamouring for my next book and you will be pleased to hear that ‘The Travelogue’ is well on the way in fact I am just about to descend upon another unsuspecting country tee hee. Do you ever do what I believe is unfairly called a “vanity internet search?” No! Well maybe you should, it’s great fun and not at all vain – well at least I don’t think it’s vain and even if it is at least vanity is a form of self indulgence that doesn’t make you blind! The other day – well yesterday to be honest – I hate the fact that Cat’s can’t tell a lie, don’t you? I pawed in my name into www.bing.com, (I try not to use www.google.com for all of the reasons I’ve bored you with over the years, although that might change soon because next year they have asked to sell the ebook version of my award winning book ‘Getting Out – Excerpts from a Cat’s Diary’ through their new Google eBooks thingy that you may have read about – bless them) and guess what I saw a new image of me and it is, I have to say, pretty much like all of the other great pictures of me – wonderful. 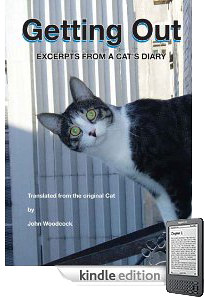 So I thought I would share the new image of me with you good readers, you can find it for yourselves if you want to on the Kindle edition page on Amazon.com but I know that basically humans are lazy and so I thought I would not only add a link to the page but also show you the wonderful picture. You have to admit it is a great portrait isn’t it – just look at that unblinking stare, the strong chin, my chiseled features, those lush furry ears and sharp eyes, mmh maybe I’ll stop there I think I am beginning to sound a little sinister!